This strategic development plan aims at implementing the following current good practices in furtherance of our social and evangelical development agenda which has remained our traditional mission since our inception. It carries with it a vision to support communities in which we work to identify and take action to address the identified needs, ‘ipso facto’, planning for the sustainability or continuity of our works. It embodies the strategy of a ‘Teamwork Approach’ including partnership, relationship and collegiality which is our common practice. We wish to reach a massive audience beyond our own congregations or communities to help us harness support for the pursuit of a more vibrant Spiritan mission in the Province of The Gambia, as well as accommodating the imperatives of the growing local church family. This mission forms the basis of our traditional charism which is the driving force that dominates the Spiritans. In the light of the above disposition, we are engaging in the implementation of strategies to better communicate the Spiritan identity to the wider Community. In the present dispensation this is being made manifest in our strategic development plan, 2016 – 2018. The projects for the current period fall within the following categories: A secretariat (Spiritans’ Mother-house), Civic hall and Vocation development (building of a seminary for the formation of young Spiritans). 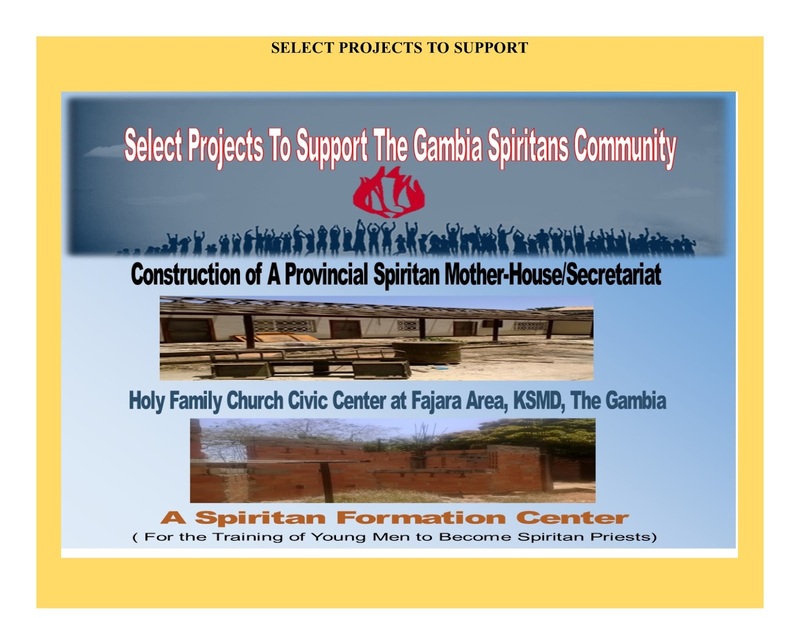 For many years now, beginning with the Provincial Congregation’s’ decision in 2015 to embark on this strategic planning process, a large number of individuals representing the many constituencies of the Province of The Gambia Spiritans group in collaboration with the authorities in Rome have given much time and thought to create a plan that will take the Province of The Gambia Spiritan group from an excellent to an extraordinary chapter. The plan is bold and forward-looking. It is intended to clarify and elevate expectations and performance, as well as being meant to challenge us and to serve as a catalyst for planning and action. It is transformational by nature. As we begin this development programme, we can proudly state that the future is bright. The vision of the Spiritans Province of The Gambia being built on a foundation of Catholic faith rooted in Spiritan mission is clear. This plan will thus have its effect in providing clear goals to guide the growth of The Gambia Provincial Chapter well into the future which is full of endless possibilities. Rooted in an all-round excellence, committed to building a community of “one heart and one mind’’, and fostering a strong sense of generous service to the 'poor', the goals outlined in this plan give us a strong vision for the future. Therefore, building on the strong identity that we have as a Spiritans, we are very excited about the many opportunities that this plan will provide for current and future times. 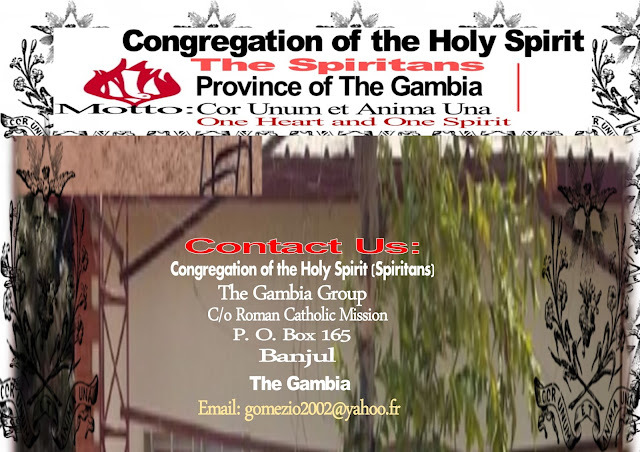 In conjunction with the authorities in Rome and our diverse prospective sponsors and supporters for our growth process, we will continue to sharpen our understanding and implementation of the Spiritans' charism, and investing in, as well as planning for ongoing facilities improvement and growth that will position the Province of The Gambia to be formidable in the propagation of the gospel of Christ. We are very optimistic that with the support of our diverse constituencies, the future is indeed bright, and we look forward to bringing this vision to reality in the nearest future. Hoping that the work will begin in earnest, we eagerly welcome your active participation in the implementation of these ambitious goals which provide us with a transformative vision for the future! 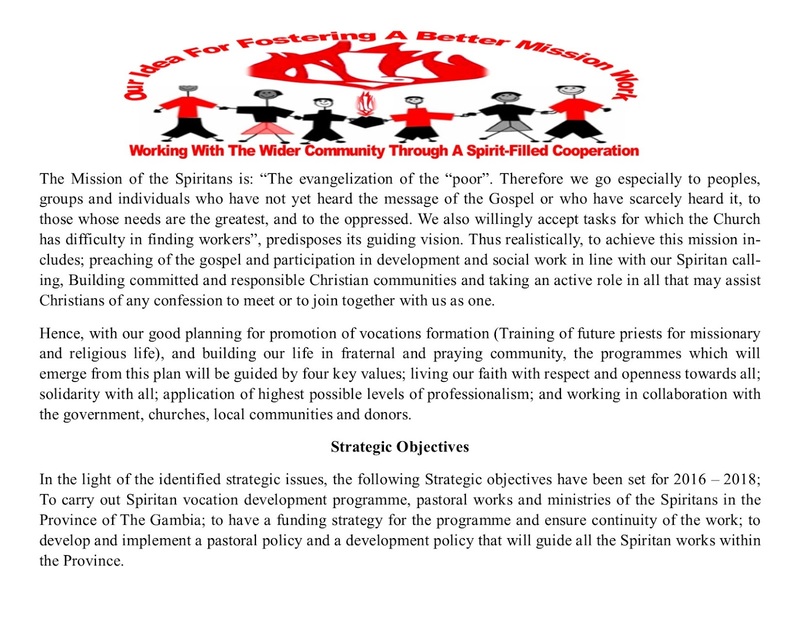 This strategic plan focuses on principles based on good practice in development and pastoral work that would guide all the Spiritans works in The Gambia for the next two years. After going through the SWOT analysis the group has redefined and articulated its Vision, Mission and Core Values. The programme will carry out the following key activities from 2016 to 2018. The Action plan has been drawn and Strategic targets have already been set. These Spiritans’ pastoral and development project policies have been developed while considering the needs of the Province of The Gambia. All the risks involved in the implementation of this plan have been assessed and risks management strategies have been identified. Also, the leadership, roles and objectives of the projects have been well defined, and all the checks and controls needed for administration of these projects have been duly considered. We have established the core principles to guide our current agenda, which include in the main, among others; Flexibility, mobility and adaptability to undertake new responsibilities, as new missions and new realities are our priority; Ensuring continuity of our works where possible, and looking critically at the past to plan and build for the future. It seems comparatively easy to obtain foreign help for socio-developmental projects but very difficult to obtain it for pastoral and spiritual projects. The Catholic Church in The Gambia is considered as NGO hence many people see it as a foreign body that is rich because it depends from outside donors. This is particularly challenging in the case of the presence of foreign missionaries. The people are always at the receiving end and this creates a dependency syndrome. Their “model” of Church is the one of a “club” for the benefit of its members. Christians tend to look at themselves as “clients or beneficiaries” of the Church. They often ask what the Church has done for them not for what they can do for the Church. Local donations to the Church, offertory and church collections are negligible and most insufficient in managing the needs of the local church. The notion of “free and voluntary work” for the Church is very limited. Almost all who are willing to render services to the church are for service charge, some are asking for formal salaries, allowances contracts, etc. The understanding of “Lay Ministries”, recommended after Vatican II, is very difficult in this context. The local Christian communities are not fully aware of their responsibilities in terms of contributing to the growth of their Church. We have a limited number of Lay Catholics who are competent and professionals to contribute or give advice to our works. The Catholic Church is by and large depending too much on foreign help from agencies and donors. There are very few initiatives towards income generating projects. The very good examples of the Catholic Church in other parts of the region in this field of setting income generating projects for the church is almost impossible in The Gambia.